Definition at line 39 of file dirent.h. Definition at line 148 of file ff.h. Referenced by dir_next(), and dir_sdi(). Definition at line 47 of file dirent.h. Definition at line 42 of file dirent.h. Definition at line 50 of file dirent.h. Definition at line 61 of file dirent.h. Definition at line 58 of file dirent.h. Definition at line 150 of file ff.h. Referenced by dir_alloc(), dir_find(), dir_next(), dir_read(), dir_register(), dir_remove(), dir_sdi(), f_chmod(), f_getlabel(), f_mkdir(), f_open(), f_opendir(), f_rename(), f_setlabel(), f_stat(), f_unlink(), f_utime(), follow_path(), and get_fileinfo(). Definition at line 151 of file ff.h. Referenced by create_name(), dir_find(), dir_register(), f_chmod(), f_mkdir(), f_rename(), f_unlink(), f_utime(), and follow_path(). Definition at line 144 of file ff.h. Referenced by dir_alloc(), dir_find(), dir_next(), dir_read(), dir_register(), dir_remove(), dir_sdi(), f_chmod(), f_closedir(), f_getlabel(), f_mkdir(), f_open(), f_opendir(), f_readdir(), f_rename(), f_setlabel(), f_stat(), f_unlink(), f_utime(), and follow_path(). Definition at line 145 of file ff.h. Definition at line 146 of file ff.h. Referenced by dir_find(), dir_next(), dir_read(), dir_register(), dir_remove(), and dir_sdi(). Definition at line 156 of file ff.h. Referenced by create_name(), dir_find(), dir_read(), dir_register(), and get_fileinfo(). Definition at line 157 of file ff.h. Referenced by dir_find(), dir_read(), dir_remove(), and get_fileinfo(). Definition at line 147 of file ff.h. 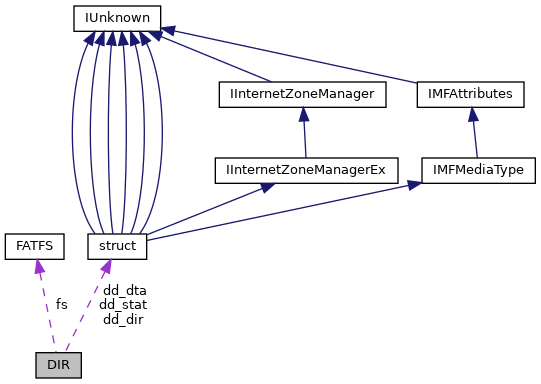 Referenced by dir_sdi(), f_getlabel(), f_mkdir(), f_opendir(), f_rename(), f_setlabel(), f_unlink(), and follow_path(). Definition at line 149 of file ff.h. Referenced by dir_alloc(), dir_find(), dir_next(), dir_read(), dir_register(), dir_remove(), dir_sdi(), f_readdir(), and get_fileinfo().